Villa Pandu and villa Yudhistira, our beautiful holiday villas, are situated at a quiet location directly at the beach of North Bali, just west of the town of Seririt. VILLA PANDU: The Villa breathes an atmosphere of peace and relaxation combining the unique Balinese spirit with the highest level of modern comfort. Its large pool, lush tropical garden and magnificent view over the Bali Sea and the palm tree forests and mountains at its south border, make this accommodation the perfect getaway for a relaxing luxury holiday for up to 8 guests. The villa is located on the beach in Brong Bong, a village close to Lovina, centre of North Bali and home to many restaurants and bars. For about 50 euro per day you can rent a taxibus with an English speaking driver, which can transport up to 7 people. You can make use of this service 24 hours a day. The four large, beautiful bedrooms all have air conditioning and fan. The romantic four poster beds have excellent mattresses so you can start each day well rested. 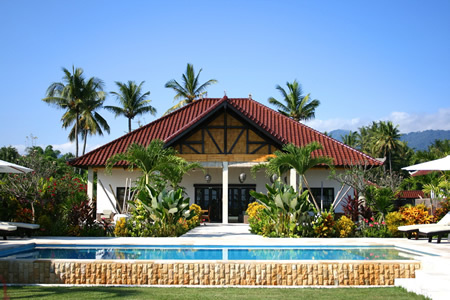 The villa is for rent throughout the year. Of course, the villa has all the amenities to make your holiday even more enjoyable. Fresh spring water from the water cooler, a washing machine and dryer are at your disposal every day. You can ask the staff to take care of your dirty laundry for very little money. 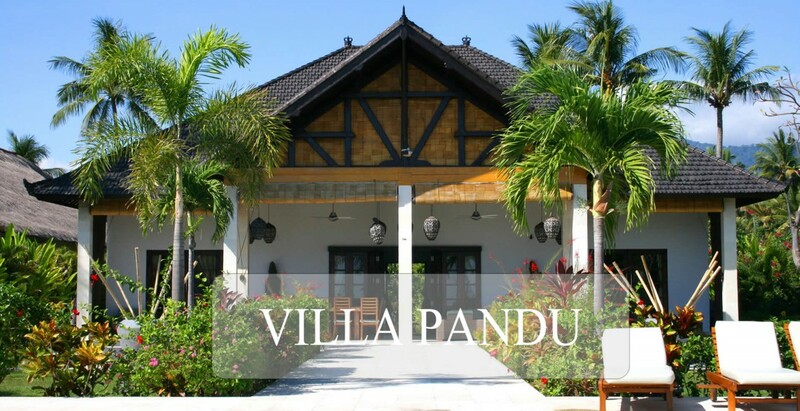 Villa Pandu is fully staffed with carefully selected, friendly and professional staff. Our aim is to offer our guests a truly delightful and self-indulgent holiday experience by combining the easy luxury and facilities of the best hotels with the freedom and privacy of a villa holiday. If you wish to rent villa Pandu in North Bali for an extended period, then a special price agreement can be made. © 2019 Villa Pandu North Bali, all rights reserved.